An upgrade version of Left Hand Rings by Duggelz. The biped slot number have been changed for people who had conflict problems using the original mod, along with a bunch of added new features. Any further uploads for public distribution of this mod's contents must obtain permission from myself and the other content creators listed below. Duggelz for making Left Hand Rings and granting permission for this release. MadNuttah for the ring mesh from Rings Of Tamriel Modders Resource. Saerileth and Gamwich for permission to use their ring meshes and textures from Gemling Queen Resources. Brumbek for permission to use the ring resources from Static Mesh Improvement Mod - SMIM. cdcooley for sharing how to add icons to SkyUI menus. 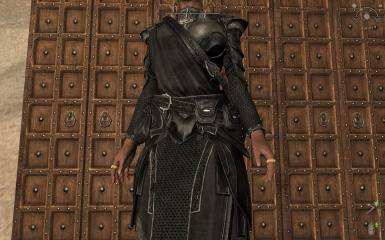 Added compatibility for Ethereal Elves Overhaul and Imperious-Races of Skyrim. Removed the recipes for the broken left hand versions of the werewolf and vampire blood magic rings. Added recipes for forging the werewolf and vampire rings back to the vanilla right hand versions. - Removed wild navmesh edit from the CCOR version. -Fixed Bone Hawk Ring recipe. -Added ring icon and labels for the left hand rings in the SkyUI menus. -Thanks again to Astakos for QA. -Added left hand version of the 4 werewolf rings. -Added left hand version of Ahzidal's rings. -Fixed nif in the bsa file for Gemling Queen Jewelry option. -Added a new set of left hand rings using resources from Gemling Queen Jewelry. 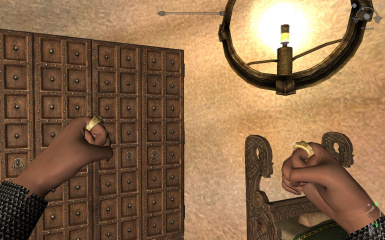 -Added a new set of left hand rings using resources from Static Mesh Improvement Mod. -Changed bodyslots to 50 and 51. -Added a left hand version of the Ring of Namira. -Fixed left hand version of the Ring of the Erudite. -Fixed conflict with Dragon Aspect shout. -Fixed Bone Hawk Ring error. -Other possible things that I don't remember at the moment. -Added the missing 4th vampire ring. -Changed the recipes for the vampire rings for consistency. -Forging rings may or may not require one or more of the following smith perk: arcane, ebony, and steel. Updated USKP and UDGP fixes to version 2.1.2.0. Added USKP and UDGP fixes to the 1st person view ring files. First-time installs will now receive a one-time text message to verify the mod is working instead of a free silver ring. Removed need for left-specific materials for crafting the left rings. Added left hand vampire rings (Dawnguard versions). Fixed dark texture problem for the Bond of Matrimony. Fixed issues with keywords and globals (CCOR versions). Daedric Artifact rings are now subject to "Night-Only" crafting restriction if enabled (CCOR versions). Added option for viewing Left Hand Rings in 1st person. (For the Vampires) Ring of The Beast moved to the left hand; allowing it to be worn at the same time as Ring of the Erudite. Added links to Spanish and Italian translations of the mod. Added wedding ring with new mesh and texture. Removed need to forge a left hand wedding ring from the vanilla right hand ring. Wedding ring moved to ring finger of the left hand. Wedding ring no longer can be disenchanted. Added choice of slot number for the wedding ring (compatibility vs funtionality). Adds rings that are worn on the left hand. These rings can be crafted, enchanted, bought from merchants, and found randomly as treasure. This release is a modification of Left Hand Rings by Duggelz. This mod was initially created in response to the many requests posted on the original mod's page for a different body slot number to resolve conflicts with certain mods. • 6 new left hand rings using the missing combination sets of ring/gemstone. • A new Bond of Matrimony ring that can be worn all the time on the proper hand and finger. 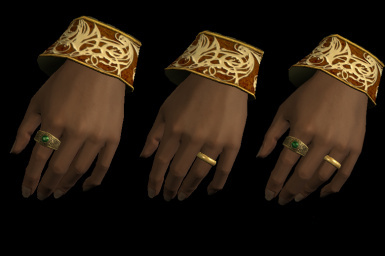 • Left hand convertible versions of the Ring of Hircine, Ring of Namira, Bone Hawk ring, and Ahzidal's rings. • See rings on your left hand while in first person view. • Ring icon and label for the left hand rings in the SkyUI menus. • Support for Complete Crafting Overhaul Remade, Static Mesh Improvement Mod, and Gemling Jewelry Queen. • Compatible with Dawnguard, Dragonborn, and the Unofficial Skyrim Legendary Edition Patch. This list only contain mods that I have personally tested or reported by other users. - Added compatibility for Ethereal Elves Overhaul and Imperious-Races of Skyrim. - Removed the recipes for the broken left hand versions of the werewolf and vampire blood magic rings. - Added recipes for forging the left hand werewolf and vampire rings back to the vanilla right hand versions. 2. Save and exit game. 3. Install and enable "Left Hand Rings Modified". 3. Disable and delete the installed version. 4. Install and enable the latest version. 3. Disable and delete "Left Hand Rings Modified". Shadowjin for the How To Make Things Visible In First Person guide.